Add bold curves and dramatic height to your landscaping with the Panacea Black Scroll Trellis. Placing a trellis in your garden or yard brings wonderful height to the area, and can also provide support for your favorite climbing plants. The 24" width of this unit creates a focal point in moments, enhanced by the large scrolls within it. Horizontal rods above and beneath the scrolling detail lend strength and contrast to the item, furthered by the metal construction. The black, powder coated finish protects the unit from the elements while remaining beautiful, and the two, 12" long legs install into soil in moments. The significant, top arch completes this item, and the varied rods create plenty of support areas for your honeysuckle or ivy. 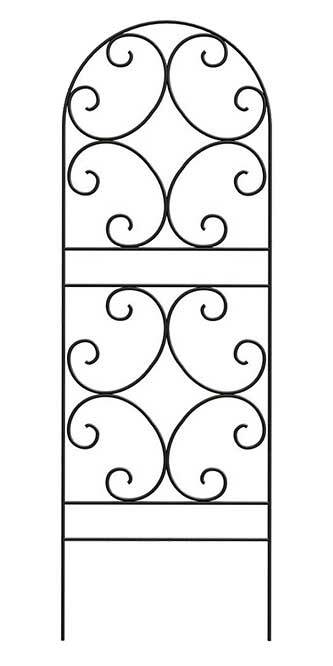 Bring an elegant look to your garden or landscaping with this Black Scroll Trellis. Rail Dimensions: round rails, 0.375" dia.